Skills: Can control weather, the closer she is to water the stronger the ability is. Shape-shifts into a human but needs to be in the ocean on the nights of a full moon. Likes: Quinlan, seashells, pretty things, eating people. Dislikes: Strigoi, the master, the ancients. Personality: Quiet and broody, can be playful and loves to make the humans uncomfortable. She sings and loves to groom herself. So if Marina is an Atlantic Mermaid, what's a Pacific Mermaid? If a mermaid was in a crowd of humans, would the strigoi know which one was the mermaid? They would be able to smell them, yeah. Atlantic mermaid is a mermaid born in the Atlantic, Pacific mermaids are born in the Pacific. The Mer race can shape shift into humans but need to be in the ocean on the nights of a full moon or they will not be able to turn back into their natural form. 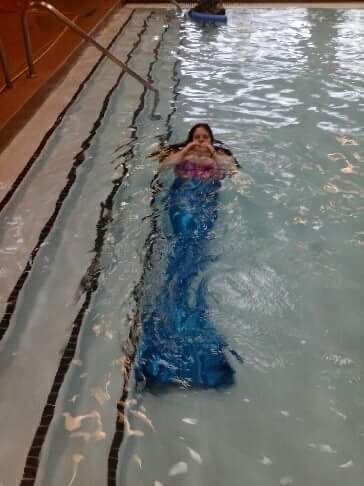 I swim in mermaid tails at pools and at the beach and have studied their legends and such since I was a child lol I have a very unhealthy obsession. Wasn't sure if the Atlantics vs Pacifics were different somehow in physiology, etc. 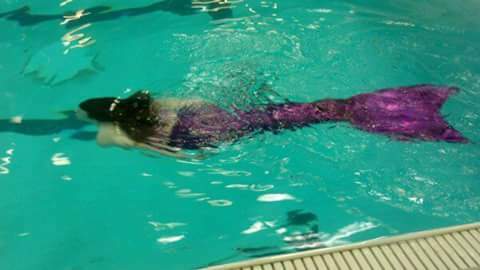 Is it hard to swim with a mermaid tail? You must get lots of attention! I've been swimming since I was a child so its easy for me. But they are going to ban monofins and tails from the pools here cause some idiot that didn't know how to swim in one almost drowned. I have 3 different tails. Way cool! Love the colors. Hope you can find another pool in which to swim. Thanks, you cant see it but there is a purple dorsal fin on the second blue tail. The YMCA was the only pool we liked to go to cause there are jocks at the others who like to laugh, make fun, and pull on your tails. They'll pull you under and stuff. I hate it. Oh I did too as a little kid! I would try to swim and leap like a dolphin. It's good for core strength, LOL! Here's a guy doing a dolphine jump. I used to tie my legs together when I was a small child and jump in the pool lol I learned to swim with my legs together and my arms behind my back. I'm better underwater than I am on land x_x I fall a lot. Now I want a monofin. Super bad. Just make sure someone is with you if you get one and swim in it!